In a press release made available on Wednesday, America's largest cable sports provider ESPN announced that their network will broadcast 9 of the 10 races in the 2010 NASCAR Sprint Cup's Chase for the Cup Championship. With the 10-race Chase for the Cup airing entirely on ABC through the past 3 seasons, the over-the-air channel will only show the October 16th night race at Charlotte Motor Speedway. “Last year’s performance showed us that ESPN provides the best home for NASCAR,” ESPN's executive vice president of content John Skipper said regarding the increased Sprint Cup coverage on the sports channel. Only 3 NASCAR Sprint Cup races will be televised on the ABC channels for 2010. Back in 2000, NASCAR took the direct role in negotiating the season long coverage of the three major series (Sprint Cup, Nationwide, and Camping World Truck Series) in an effort to not only net a bigger money deal but to gain broadcasting partners committed to expanding the exposure of professional stock car racing. In the inaugural season of the initial NASCAR TV deal involving FOX and NBC stations in 2001, 9 of regular 36 races were shown on cable channels while the rest aired on over-the-air networks. With only one event per week in their major division, this exposure on wide network television was important as NASCAR was continuing to push growth of the sport's brand. After the 2006 season, NBC decided not to renew their contract with NASCAR (though cable relative TNT did resign) allowing an ABC/ESPN deal to be formulated. 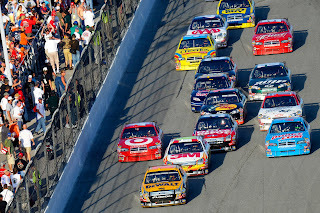 Though ABC and ESPN had been pivotal in the past with fostering the once more humbler NASCAR series to a national audience, the loyalty of the networks to NASCAR since their return is not equal to Fox or even TNT. In fact, it seems ABC's commitment for sports coverage appears to be dwindling. Moving ABC's long-established Monday Night Football to ESPN in 2006, this has been the most transparent to the media company's choice to empathize sports on their specialty channel. For NASCAR, the likeliest reason for this move from over the air to cable television is money more than viewership. ESPN benefits from a much higher pay per carriage fee from cable and satellite companies in the US which makes it more profitable to air increasingly more expensive sporting events when TV ad revenue takes a dive. Because of the 9 NASCAR Sprint Cup Chase races shifting to ESPN, there will be more live races airing on cable channel than on major networks for the first time since NASCAR began brokering the TV packages. “This is exciting news for NASCAR and our fans,” NASCAR's Media Group President Paul Brooks assures the observers of the stock car racing series. However, is it quite a disenchanting event when 20 races on cable for 2010 appears to be regressing NASCAR. A stumble in at race attendance and slightly lower TV ratings in later years of the Sprint Cup have led the sanctioning body to rethink their sport. Attempting double-file restarts through more than half a season in 2009, there is also considerations being made to the race cars planned to compete at the Daytona 500 using everything from removing out-of-bounds lines to enlarging restrictor plates to speed up the cars.